Installation of the Sway Fun and Zip Krooz occurred on Thursday May 4th and Friday May 5th. Thanks to the local Elk’s group for their fundraising effects to make this project a success! Below are preliminary photos for the future expansion for the Elks Inclusive Park. There are also photos of equipment that was installed in 2017. In the link below, the black features note the equipment that was put in this year (2017), the light green are plans for the 2018 and future equipment to be added. Installation of the new playground at Rotary Park (760 School Rd. NW) occurred on Tuesday May 16th and Wednesday May 17th with generous help from the local Rotarian’s. The playground should be ready for use once weather conditions dry out, allowing the safety surfacing material to be placed around the new equipment. In the meantime, the public is asked to stay off the equipment. The playground should be ready for full-fledged fun on Thursday May 25th! Please call the Parks Department if you have questions 320-234-4228. Two of the photos show the home for the new Roberts playground. The old equipment was removed a month ago, due to age and lack of meeting playground safety standards. 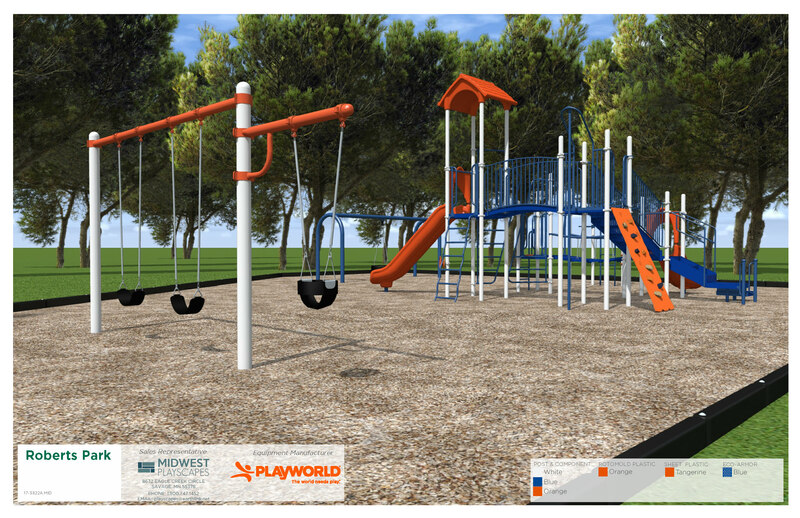 This new playground will be located in the same general area as the old playground (west of the parking lot). Have you visited a Playground lately? Bring the kids to a different playground each week. Download our Playground List below. Through the Huthcinson ParkFinder Interactive Map, we offer our citizens a unique geographic perspective of our city and its amenities.